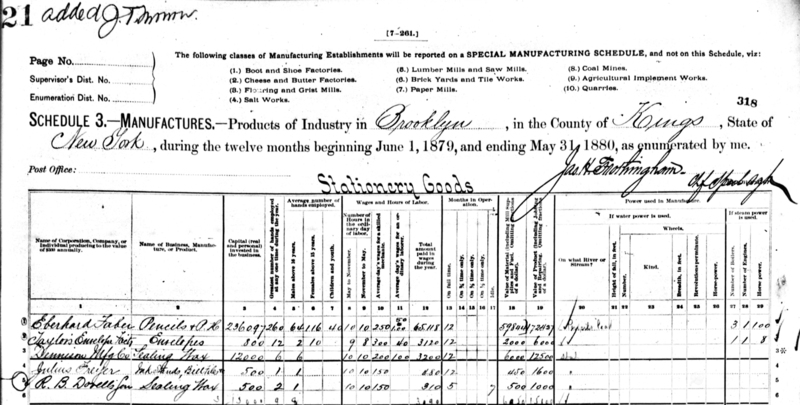 Schedule 3.—Manufactures.—Products of Industry in Brooklyn. It’s the end of August and a beautiful summer day. The birds are chirping and the sun is shining, which means there’s only one thing to do: Browse through the archive of I.R.S Tax Assessment Lists. It all seems so simple, including The Eberhard Faber Company’s description of being a manufacturer of “pencils”. Imagine the extraordinary care with which the preparer entered each item and looked after this single piece of paper, as being the only record of this information. 2 Responses to Schedule 3.—Manufactures.—Products of Industry in Brooklyn. And not one but two sealing-wax companies. A great find, Sean. I hope there’s more along these lines to come.